Rhubarb season will be winding down in our region soon, but it's not too late to enjoy it! This quick bread has just a hint of spice which combines nicely with all the tangy rhubarb. 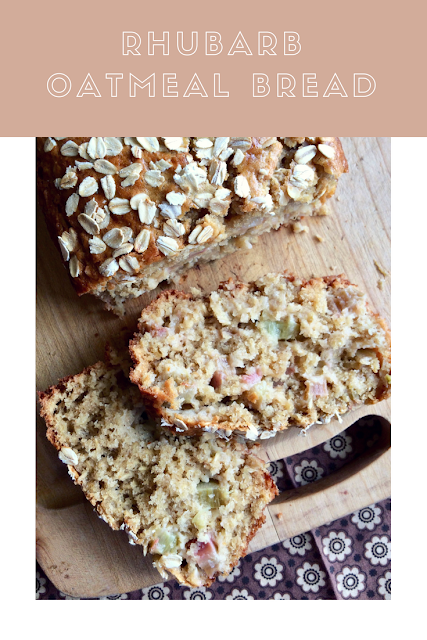 This recipe is a spin-off of my blueberry oatmeal muffins, but this time baked into loaf form (to allow the rhubarb a bit more time to break down). 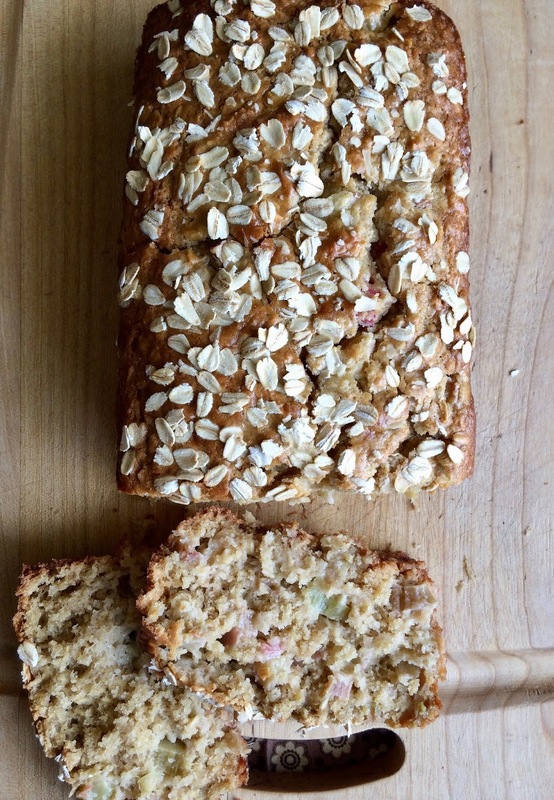 It is loaded with rhubarb, and it's crumbly, moist, and best eaten within a couple of days of baking (which is never an issue in our house). One of my kids absolutely goes wild for muffins/quick breads. But, thankfully, he's also been gobbling up asparagus spears, too. So far he seem to have inherited his parents' love of food! For my local readers, I've created a new Facebook group - WNY Seasonal Living & Cooking. It's a group for all of us in the western NY region who enjoy local and seasonal food. So please join us in you are interested in learning and sharing all that our region has to offer. Lightly grease a 9"x5" loaf pan. Preheat the oven to 350 degrees. In a medium bowl or glass measuring cup, stir together the oats and buttermilk and set aside. In a large bowl, whisk together the flour through sugar. Stir the vanilla, egg, and oil into the oat mixture until well-combined. The stir the mixture into the dry ingredients until just combined. Fold in the rhubarb. Pour the batter into the loaf pan and spread it evenly. Sprinkle the top with more oats. Bake for about 55-65 minutes, until the sides and top are golden and an inserted toothpick comes out clean. Let cool for about 30 minutes before slicing. Store in an airtight container for 1-2 days. *If you don't have buttermilk, simply put one tablespoon of lemon juice in the one cup measuring cup, then fill with milk and let sit for 5-10 minutes. That's a very moist and delicious quick bread! 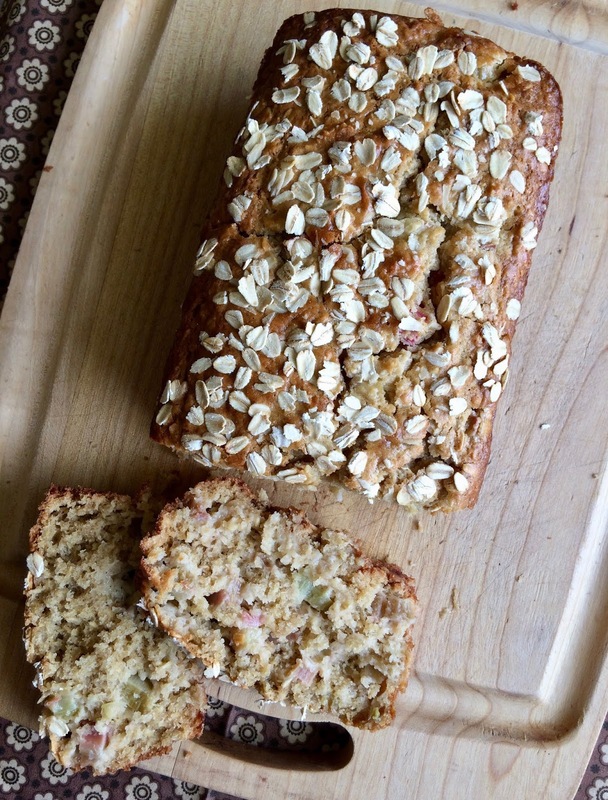 I love how the chunks of rhubarb have come out in the finished bread, it looks so good. Would love to have a slice for breakfast! I was at the supermarket yesterday and was looking at the rhubarb. Didn't buy any, but now I wish I did. This looks terrific! Thanks. I need to look for rhubarb, this sounds excellent! Thanks. yum! the texture of your bread looks so appealing--pillow soft and full of good stuff!